Okay, so this isn't going to be the most interesting post I've ever written and Ragu Pizza Sauce obviously isn't the most unique or intriguing food to be blogging about. But, I've been meaning to write about Ragu Homemade Style Pizza Sauce for a long time, simply because I absolutely love it (don't tell anyone but I have been seen eating it on its own, right from the spoon). 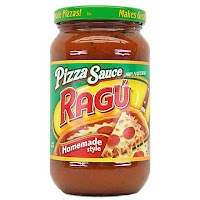 #1: Ragu Pizza Sauce is 100% all natural and contains no additives, preservatives, or other bad ingredients that I avoid. #2: Every 2 servings of the pizza sauce is equivalent to 1/2 a serving of vegetables. #3: A quarter of a cup (which is a lot for sauce) is only 30 calories, 1 gram of fat, 1 gram of fiber, and 1 gram of protein (so it is very balanced). This means one serving is 0 weight watchers points (yep, a delicious "free" food), and two servings (half a cup) are 1 WW point. You can weigh out an exact serving on a great food scale. #4: Ragu pizza sauce is really different in taste from most tomato sauces. It has the right amount of pizza flavor, and tastes just like you'd expect pizza sauce to taste at a restaurant. So, I haven't come up with a super creative way to use the pizza sauce beyond the obvious (aka making pizza), although sometimes I will add a tablespoon to tomato-based spaghetti sauce to give it some added flavor, or I'll use it as a dip with vegetables or various other foods like low calorie pizza pretzels (that taste just like thick pizza crust). If you want to use Ragu sauce to make low calorie pizza, you can do so on low calorie english muffins, whole wheat pita, or on low calorie whole wheat tortillas. If you have a super creative way that you use pizza sauce (especially Ragu), I'd love to hear it! and it's not too too sweet? It is really hard to make a food that makes me say "this is too sweet," so I might not be the best judge. I think it is really good pizza sauce, and I don't feel like it is overly sweet, but if you don't like the taste/sweetness of pizza sauce you might want to pass. great to know! I love your site...cant wait to look around! I also love Ragu sauce!